A terrific choice for big crowds! Look at this king-sized Presto Electric Tilt 'n' Drain Big Griddle that will serve up a dozen pancakes or french toast slices at one time on its 19" x 13" cooking surface. It is fully immersible with a cool touch base and slide out drip tray. It is designed with 120 v. and 1500 watts for great cooking results. 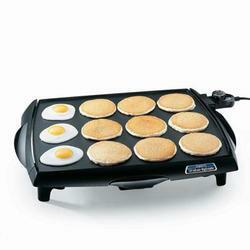 "Squarish" griddle shape Offers a more compact shape for cooking a big amount of food. Cool touch base Allows griddle unit to not over heat the surface on which it is sitting. Tilt 'n' drain Permits pouring off accumulating grease during cooking. Fully immersible And fits most dishwashers. Remove heat control before washing. Control Master heat control Maintains desired temperature automatically.